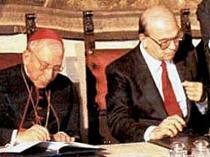 Cardinal Casaroli and the socialist Prime Minister Craxi signed the revised concordat in 1984. Most Italian politicians were so impressed at the idea of being part of an historic occasion that they didn't carefully examine the concordat before waving it through. By the 1980's it was clear that Italy would no longer accept the 1929 Lateran concordat made with Mussolini. The Italians had voted in referenda to legalise divorce (1974) and also abortion (1981). There was no chance of maintaining the Catholic Church as the official state religion (art. 1), with its priests' salaries paid by the government (art. 30). Ostensibly “Vatican II” was the reason for revising the concordat with Mussolini. The updated concordat invokes the “Declaration on Religious Freedom” issued by the Second Vatican Council in 1965. However, nothing there quarrels with the privileges given to the Church in the 1929 concordat. All it requires is that adherents of the other religions be allowed to worship freely. 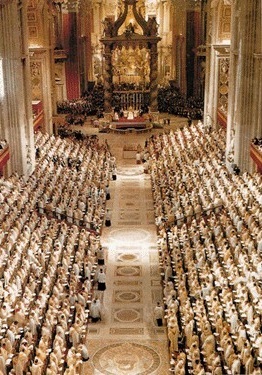 The 1984 concordat kept the Church receiving state funds (Article 7.6) until a “voluntary” system could be devised which, by default, would still give the lion's share to the Church. This is how it works. What was done with this provision illustrates how concordats work. They enforce minimum concessions to the Church, but have nothing to say when the state exceeds these. And in the face of a tight electoral race, giving the Church more than the concordat required struck an Italian politician as the shrewd thing to do. At the end of 2005 Silvio Berlusconi, then the centre-right Prime Minister, extended the Church’s tax exemptions to include buildings used by the Church for businesses such as hostels or health clinics. Mr Berlusconi’s move was regarded by the Left as a blatant attempt to court the Catholic vote on the eve of the 2006 elections, which he narrowly lost to Romano Prodi and the centre Left. The Prodi Government amended the tax breaks [in 2006], saying that only Church activities “which are not exclusively commercial” were exempt. However, the word “exclusively” left a loophole allowing properties with even a minor form of religious activity to benefit. The state subsidies were so blatant that in June 2007 it was reported that the European Union's competition commissioner, Neelie Kroes, had opened an inquiry into the tax treatment of the church in Italy. The question was whether the tax concessions granted by the concordat amounted to illegal state aid to Church enterprises. Then in August a junior Italian finance minister, Paolo Cento, said the issue needed to be tackled in next year's budget. A few days later a senior Vatican official offered to renegotiate the concordat. However, under pressure from both the Vatican and Italy, the EU investigation was dropped and there was no more talk of any willingness to renegotiate the concordat. Another attempt to investigate possible breaches of EU competiton law was announced in 2010. Thus parliament must authorise the extension tax benefits to other denominations, which can let political pressure be brought to bear on the decision. This has worked to the disadvantage of Italian Muslims, for in the present political climate the Muslims are not able to obtain an intesa. Italy's tiny, rocky island of Lampedusa lies between North Africa and Sicily. In 2008 most of the 36,952 Africans who came by boat ended up on Lampedusa, a 75% increase on the year before. In 2009 Italy began forcing the return of boats to Libya and the next year its parliament voted to prevent funding to Islam. 1. James T. Richardson, Regulating Religion: Case Studies from Around the Globe, (Springer, 2004), Google reprint, pp. 208. 2. Domenico Del Rio, "L' 'unité des catholiques italiens' ", Le Monde diplomatique, May 1988. 5. Mauro Giovannelli, "The 1984 Covenant between the Republic of Italy and the Vatican: A Retrospective Analysis after Fifteen Years", Journal of Church and State, Vol. 42, 2000, p. 529. 9. James T. Richardson, Regulating Religion: Case Studies from Around the Globe, (Springer, 2004), Google reprint, pp. 208. 12. 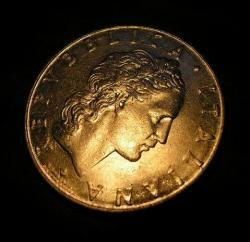 Vatican Bank (Institute for Religious Works), Concordat Watch. 15. 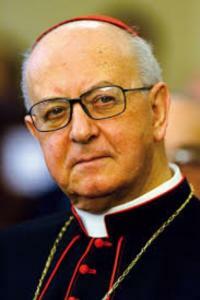 "Italian bishops concerned by terms of religious freedom law", Catholic World News, 8 July 2007. 18. Manfredi is a frequent contributor to conferences of the Compagnia delle Opere, a powerful business and cultural group which advocates the privatisation of state enterprises and the promotion of Catholic social policies. It was founded in 1986 by Monsignor Luigi Giussani.